Unarmed builds always had a group of fans in previous Fallout games. While this build may underperform when compared to Power Armor builds with Two-handed Weapons, we have decided to build one anyway for the small group of unarmed enthusiasts. This build utilizes Unarmed Weapons, high melee damage bonuses from Strength, and is designed to be played in a team. This build should also be very fun in PvP, especially in closed areas and inside of buildings. Below you will find all the recommended Perks for each of the SPECIAL attributes. Perks were chosen specifically for non-Power Armor users and team play. If you decide to use a Power Armor and/or play solo, you should replace the Barbarian, Ironclad, Moving Target, and Charisma Perks. Odealo is a secure trading platform for MMO gamers. 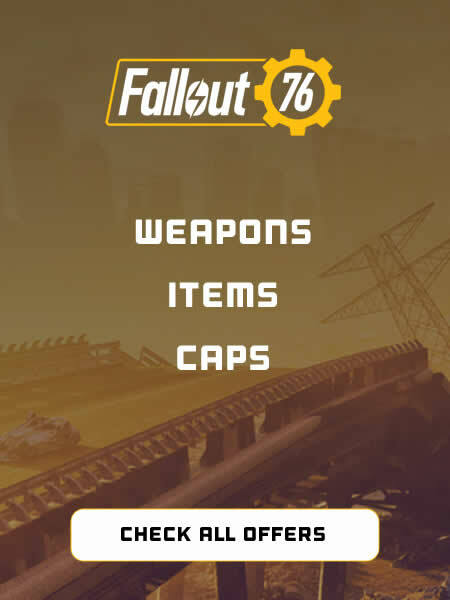 It is also a player-driven marketplace for Fallout 76 Caps and Items. Your punching attacks now do +20% damage. The greater your Rads, the greater your Strength (max +5 STR)! Positive mutation effects are +25% stronger if teammates are mutated too. Stimpaks restore 45% more lost health. While below 20% Health, gain 30 Damage Resist, 15% damage and 15% AP regen. Sprinting consumes 20% fewer Action Points. Odealo is one of the most secure marketplaces which offers trading in Fallout 76 with the use of real cash. CHEMS: Med-X (DMG Resist +25) and Psycho (DMG Resist +25, Damage increased by 15%) are the best consumables you can use as an unarmed character. On Odealo multiple sellers compete for your attention. You are guaranteed to find Fallout 76 Caps and Items at the best prices. If you have any suggestions related to this build or you have a suggestion for our future build, let us know in the comments below. Pictures used in this article are the intellectual property of Bethseda Softworks LLC.